Helping to fuel growth in the global snack foods market, hectic lifestyles have driven consumers away from traditional meals toward quick, convenient foods. A report from Global Industry Analysts (GIA) predicts the global snack food market is likely to be worth $334 billion by 2015. Although the Asia Pacific, Eastern Europe and Latin American markets are experiencing rapid growth, even the seemingly mature U.S. and Western European markets are poised for greater snack opportunities. Innovative packaging, new flavors and convenience are steamrolling new product development, but the most important driver is healthier snacks – ones with less fat, less sodium and fewer calories -- that still taste great. U.S. manufacturers are working hard to provide better-for-you snacks. Evidence favoring better-for-you claims in salty snacks is compelling, reports the Lempert Report. Total salty snacks with organic claims are on a four-year run of sales advances – up 11 percent, 8 percent, 5.5 percent and, in the latest 52 weeks ended Feb. 19, they are up by 3.7 percent to $196.3 million, according to Nielsen Label Trends data for U.S. food stores. Even more impressive, salty snacks with reduced sodium claims had double-digit gains for four consecutive years – up 21 percent, 13.3 percent, 16.3 percent and, in the latest 52 weeks, up 18.4 percent to $265.5 million. "Today's consumer continues to buy food products motivated by taste, quality, convenience and price," says Roger Daniels, director of research & development at oils supplier Bunge Oils, St. Louis. "Nutrition, wellness, simplified and sustainable are secondary drivers, which seem to be growing in consumer importance. Food processors are tapping into those [latter] demands by taking a closer look at their food ingredients." Since oils and shortenings are key components of many snack food products, "they are prime ingredient investigation candidates," continues Daniels. 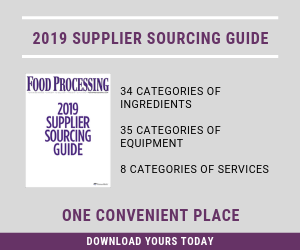 "Snack food manufacturers employ oils and shortenings primarily as heat transfer mediums in frying, structure contributors in baked applications and flavor carriers in spray oil snack cracker applications. The global savory snacks market grew by 5.3 percent in 2009 to reach $67.9 billion, according to a report by Research & Markets. By 2014, the global savory snacks market is forecasted to break $87 billion, led by processed snacks, the largest segment of the global savory snacks market, accounting for 41.9 percent of the market's total value. America accounts for 44.1 percent of the global savory snacks market value, and Pepsico Inc., Purchase, N.Y., dominates the category, with a 28.5 percent share. "Food manufacturers are interested in how to achieve oils and shortening functionality with increased levels of mono- and polyunsaturated fatty acids and minimal levels of saturated and trans fatty acids," continues Daniels. "We offer a full line of oil solutions to meet frying and spray oil applications needs. The options are based on soybean oil, canola oil and high-oleic canola oil, which contribute polyunsaturated and/or monounsaturated fatty acids -- those are viewed by the nutrition sciences community as important to maintaining a nutritionally sound diet." Bunge also offers technical service and the use of the Bunge Ingredient Innovation Center (BiiC) in Bradley, Ill., to aid snack food product developers. Bunge ingredient options are based on four technologies: RighT patented partial hydrogenation technology (using soybean and cottonseed oils) that reduces trans fats by greater than 80 percent and the sum of trans and saturates by about 33 percent; UltraBlends Designer Solutions (high oleic canola oil and, in the coming year or two, high oleic soybean oils); UltraBlends Enzymatic Solutions (an enzymatic process delivers a trans fat free shortening while optimizing saturates without partial hydrogenation); and NH technology (zero trans fat shortenings based on non-hydrogenated palm oil. Most processors already have made their initial move away from trans fats; now they're looking for second-generation solutions. "Manufacturers have been involved in a conversion from trans fat for a while, and that is what Plenish oil is all about," says Susan Knowlton, senior research manager of Johnston, Iowa-based Pioneer Hi-Bred International, a DuPont business. Plenish is a soy-based trans fat solution targeted at the fast food industry, because of its heavy reliance on frying. "This oil has exceptional stability in frying situations, and it alleviates some of the problems manufacturers encounter when frying oils go bad. It retains its properties very well and remains stable over much longer periods of fry life." One caveat: Plenish is not widely available yet, and it's not yet in any widely distributed commercial product. DuPont/Pioneer has approvals from FDA and USDA plus Canadian authorities (international approvals are still being solicited), but the specially bred soybean supply is not large enough to support full commercialization. That may come next year. Frying is an extreme environment, and there are a number of things that happen during frying, Knowlton points out. "There are physical changes that happen to the oil as the result of lack of stability through an oxidation process that occurs. There is a polymer buildup, for example, that causes negative changes to the taste. All these problems can be alleviated if you have oil that is very stable to oxidation. "That's what hydrogenated oils used to do for the industry. What we've done is create new soybean oil with the same stability as hydrogenated oil but without the consequences of trans fats." Many manufacturers find they cannot use straight soybean oil for these applications because it's not stable enough. But Plenish is a high-oleic soybean oil. "We've taken conventional soybean oil, which has about 22 percent oleic acid, and changed the profile to greater than 75 percent oleic acid. That reduces polyunsaturated fatty acids in the oil, and these are the fatty acids that are unstable. Plenish also has about 20 percent less saturated fat than conventional soybean oil, so manufacturers can look forward to a reduction on their saturated fats claim." Pioneer is working with a number of food companies now testing the oil. "We also work with the oil processor who ultimately will supply the oil, particularly when particular blends are required," she says. "We are very much involved in the testing and promotion of the product because we need to understand what manufacturers require and desire from their food products." Plenish is suitable for any snack – corn chips, potato chips, tortilla chips, etc. -- made through a frying process -- either as 100 percent oil solution or in combination if a manufacturer wants to bring in flavor from corn or another blending oil. It can be used as an ingredient oil in snacks that are not fried, or as a spray oil application for nuts, candies, and crackers where a thin layer of oil is needed on the surface. And if the application requires solids, such as in the baking industry, it is a stable base oil to blend those solid components. DuPont's Pioneer Hi-Bred unit is still working through regulatory approvals and supply issues to get Plenish high-oleic soybean oil in the hands of processors. Knowlton's advice to manufacturers is that if a new oil, like Plenish, comes on the market, it's important that R&D gets involved in testing it early because the qualification process is lengthy – moving from the lab, to a few stores, then regionally and then nationally – and it's a costly process. "It might take a year or two to qualify the oil, so you want to be there early during the pre-commercial stage to get ready for the conversion when the product becomes commercial," she says. Even before the updated Dietary Guidelines earlier this year, which call for a big reduction of sodium in processed foods, lowering salt has been top of mind for processors and suppliers. "The industry is really smart. They wanted to be prepared, so they did their homework and knew the changes were coming," says Janice Johnson, applications leader at Minneapolis-based Cargill. "We've been working to understand the functionality of salt, and we've had open dialogue and communication with the industry so that everyone has a good handle. It's important to come to terms with the sodium levels you are targeting. Then you can think about the best solution to hit that number." For topical applications Cargill offers three solutions – Alberger salt, SaltWise sodium replacer and Premier potassium chloride. "Alberger branded salt, which has a shape like a pyramid, has a lot of surface area. So when it hits your tongue, it dissolves very quickly. You get a burst of salty sensation, so you perceive the product as salty." So processors can use less salt with the same impact. "SaltWise helps reduce sodium substantially – anywhere from 33-50 percent -- but also brings the salty profile back in place," says Johnson. "The nice thing about SaltWise is its versatility since that it works in any type of application, be it topical, bars or other snacks." Premier potassium chloride lends itself to giving a salty impression, not exactly like salt does, but gives you a salty hit. "If you want to reduce salt by about 25 percent it works very effectively," says Johnson. "At higher levels, potassium chloride can lend itself to bitter metallic notes. But at Cargill we can leveraging the technical knowledge of our Flavor Group and mitigate some of those issues. Products become more customized in formulation and we work more closely with customers to give them a unique solution. It's very collaborative." A manufacturer has to understand the fundamental level the role salt plays in a specific product, according to Johnson. "In some, it's flavor. In bakery products, salt can help protein (gluten) develop in the flour, which is important for strength. If we take out the salt, how can we get to the textures we are looking for? So we leverage our Bakery Group as well as our Texturing Group to do that. It's important to understand how we can take advantage of our technical teams to create those solutions so it seems seamless to our customers." Building healthier snacks for perpetually hungry kids moves front and center.